Inglewood stands in the way of The Jacks Finals hope. 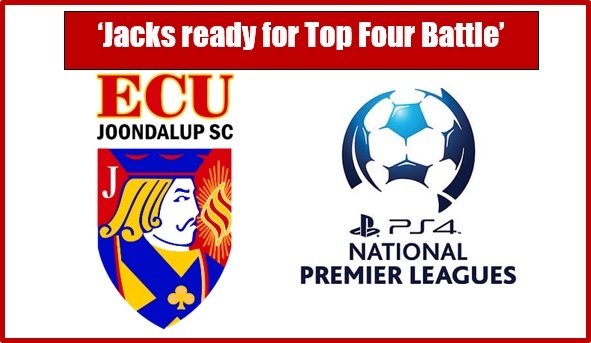 ECU Joondalup heads into the final game of the PS4 National Premier League WA season against Inglewood United, knowing a win will see them reach the West Australian Top Four Cup. The top of the table is a log-jam with six teams still in the running for the Top Four and the Jacks, who are sitting in third on the table, still need a result on Saturday to reach them. The Jacks moved third with a come-from-behind win last week against Cockburn, with striker Gordon Smith scoring a brace, taking his tally for the season to 19, and he said they were made to work for the win. Joondalup are on an 11 game unbeaten run, but Smith knows a loss on Saturday will undo all their hard work. “Inglewood are a strong side, and will be tough to beat, but we are on a great run at the moment and don’t fear anyone in the league,” he explained. Jacks senior Coach Dale McCulloch said Saturday is their fifth Cup final in their last five games, and he said they will be hoping to continue on their good form. “They need a win to win the league, and we need a win to get in the top four, it’s set up brilliantly, but we’ll be going there to spoil their party,” he said.